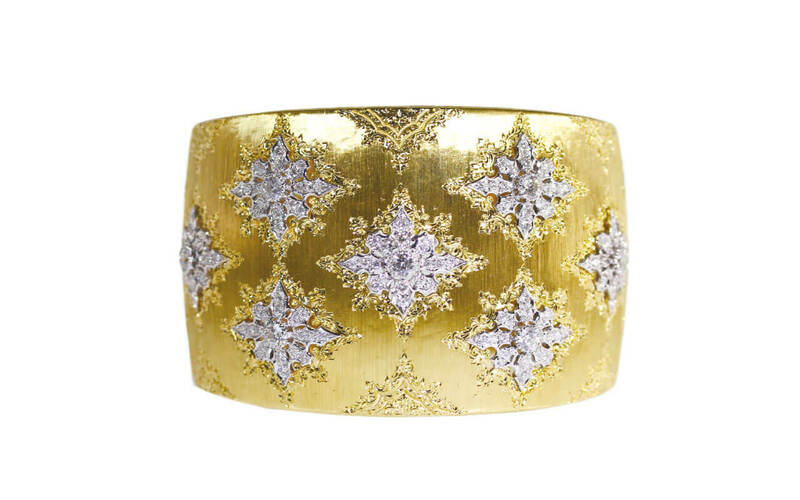 When the name Buccellati is mentioned what comes to mind is their exquisite textural gold jewelry and silver objects. Spanning many decades, their designs have maintained a high standard of craftsmanship and quality and harken back to the great goldsmith work of the Renaissance. The firm was founded by Mario Buccellati, who began his career at the age of twelve working for the jeweler Beltrami and Besanti in Milan. In 1919, Mario acquired the company renaming it to Buccellati and soon attracted an elite clientele that included European royalty and popes. With this success, Buccellati opened other locations in Rome and Florence and by 1951 was the first Italian jewelry firm to open a store on Fifth Avenue in New York City. Still a family business today, the firm has an international presence offering an eclectic range of jewels.